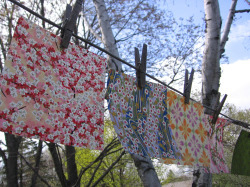 Weatherproof origami paper lets you beautify your outdoor world and make longer-lasting origami jewelry. 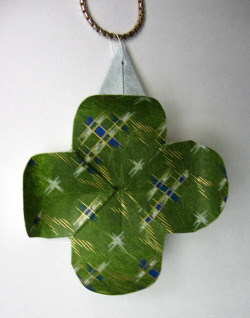 Yasutomo makes origami paper for outdoor use, but we aren't thrilled with the colors or plastic-y texture. 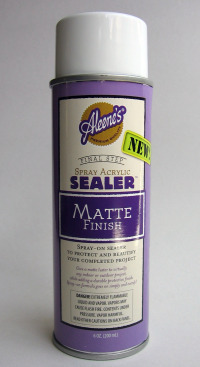 Then we found a wonderful product called Aleene's Spray Acrylic Sealer. The can must be used upright, so we hung sheets of origami paper on a clothesline and sprayed away. The rich, fabric-like Kotobuki Yuzen paper shown above took the spray beautifully. To ensure complete coverage, we rotated the paper to get the spots under the clothespins. A sheet of regular paper also worked well, but we had to be more careful of drips and runs. Outside in a light breeze, the paper dried in minutes. Please observe the safety precautions on the can. If spraying outside, be aware of the wind direction! 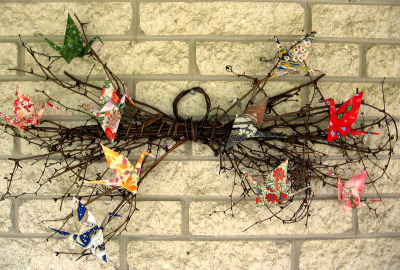 We used the treated paper to decorate an outdoor wreath with cranes and to make an origami pendant (photos below). The treatment made the paper a little stiffer, but it still folded beautifully. Give it a try! Pendant made from a morning glory. The sealer helped stiffen the paper and make it resistant to moisture and perspiration.